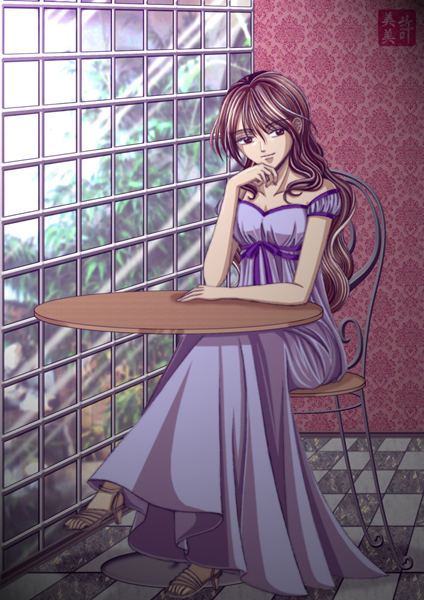 A mysterious girl is waiting patiently in 4th Avenue Cafe. Who is this girl and what, or who, is she waiting for? I changed the colors of the walls because I wanted her to wear a purple dress. 4th Avenue Cafe has purple walls, but I didn't want the character to blend with the background. I really love using my stock photo for backgrounds. Those bamboo plants were decors from a restaurant my siblings and I ate in. I was bored since they were asking the waitress about some details, so I took that picture while no one was coming in. :o I love what you did with the window!